The CURT class 3 trailer hitch is the most common type of trailer hitch installed on full-size pickup trucks and SUVs. It is also found on full-size cars, crossover SUVs, minivans and mid-size trucks. That is because the class 3 packs the punch of a heavyweight hitch while still staying light on its feet. This CURT class 3 hitch offers a gross trailer weight capacity of 3,500 lbs. and a comparable tongue weight capacity of 350 lbs. It is designed to be a custom-fit trailer hitch for certain years of the Ford 500 sedan, Ford Taurus sedan, Ford Freestyle SUV, Mercury Sable sedan or Mercury Montego (to verify your vehicle compatibility, see the CURT application guide at curtmfg.com). 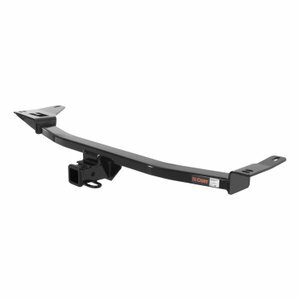 It features a square tube frame and comes with all necessary hardware for a complete installation.The 2" x 2" receiver tube opening of this class 3 hitch is able to accept a hitch-mounted accessory, such as a bike rack or cargo carrier, or a ball mount to tow most standard size trailers, including utility trailers, single-horse livestock trailers, boat trailers and large campers. One special feature about the class 3 that is not found in classes 1 or 2 is its compatibility with a weight distribution hitch. When used in combination with a WD hitch, this class 3's gross trailer weight capacity increases to 4,000 lbs. and the tongue weight capacity to 400 lbs. (NOTE: Never exceed the lowest weight capacity of any towing component).CURT class 3 trailer hitches are engineered to be strong and capable, having a quality steel frame and a solid finish. They are put through strenuous testing before being deemed ready for market and come with two coatings -- a liquid Aquence® coating and a powder coat in high-gloss black -- that cure together to form a strong resistance against rust, scratching, UV damage and other wear. Our hitches are our pride, and as such, we back them up with a limited lifetime warranty and a one-year finish warranty.